Which DIY Heat Recovery Kit is right for you.? Select your house size from the below and we will show you the kits designed for your size of house. Our ethos is to supply the highest quality heat recovery system (hrv systems) direct to the public for less cost than was ever available before. Discover the largest range of ventilation products from the leading brands that are designed to be quick and easy installed by any DIY person or tradesperson. We can also offer an installation service when required. 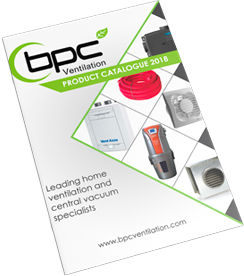 BPC Ventilation are leading designers, suppliers and if required installers of home ventilation systems, both in the UK and around the world. Whatever your requirement, budget or setting, BPC Ventilation can provide the solution you need. From heat recovery ventilation, extraction fans for the home, to multiple room extraction solutions, our wide HVAC range features a product for every air handling purpose. Our systems will help you to make your property as eco-friendly as possible using demand energy recovery ventilation and heat recovery (HRV) (MVHR). Mechanical extract systems are also available to aid new sustainable building projects to adhere to the Code for Sustainable Homes. We provide one of the largest ranges of ventilation solutions from world leading manufacturers Vent Axia, Airflow, Xpelair, Nuaire and our own home brand Quiet-Vent. This allows us to design a bespoke system using the correct products to provide a quiet and efficient system and we do not under spec products to cut initial costs. DIY Kits – We specialise in the highest quality heat recovery ventilation kits suitable for any competent tradesperson or home owner to install. Our kits will provide a quiet and efficient ventilation system. Using the latest developments in ventilation technology, we can supply the kits either by a pre designed kit with material quantities provided by over thousands of previously provided kits on our website (ideal for property renovations or small/medium sized houses) or by a bespoke designed and supplied kit by you providing plans for our designers to work from. Design Service – Our in-house design service can provide detailed plans. We accept plans supplied in almost any format including CAD, PDF and PNG. Using these plans and with close contact with the owner or builder we can complete a full set of detailed plans indicating pipe runs, Air flow rates and location of all components. Technical Support – BPC Ventilation provide free technical support by our own fully trained technicians on all products sold from us by either Live chat, e-mail and telephone conversation for the duration of the installation and beyond ensuring that all systems are operating correctly. Delivery – BPC Ventilation use a number of courier options from Royal Mail for any deliveries up to 30kg, pallet shipment by boat and lorry to all worldwide locations and Air freight for products required in the shortest possible time. Installation – If installation is required we have a number of in-house installers and a very large network of fully trained and experienced installers throughout the UK. This allows peace of mind that no matter where you live we should be able to install any of the heat recovery systems for you. Premises –our new large premises are located beside a harbour with direct access to major motorways and the airport is only 20 miles away. Our premises consist of a large showroom, offices, and distribution warehouse, car parking for over 20 vehicles and loading areas for articulated lorries. Product stock - We try to carry a large stock of all required items in our warehouse for quick dispatch. All our stocked products are available from our online store but if you require something not listed please contact us for a quotation. You can also contact us for any further enquiries. Heat Recovery Ventilation - (MVHR) (HRV) (Commercial MVHR) - A whole house heat recovery unit (Nuaire MVHR) is an energy efficient ventilation system that extracts the moist, stale air from all your wet rooms and at the same time replaces it with fresh filtered air to all your habitable rooms without letting the heat escape.